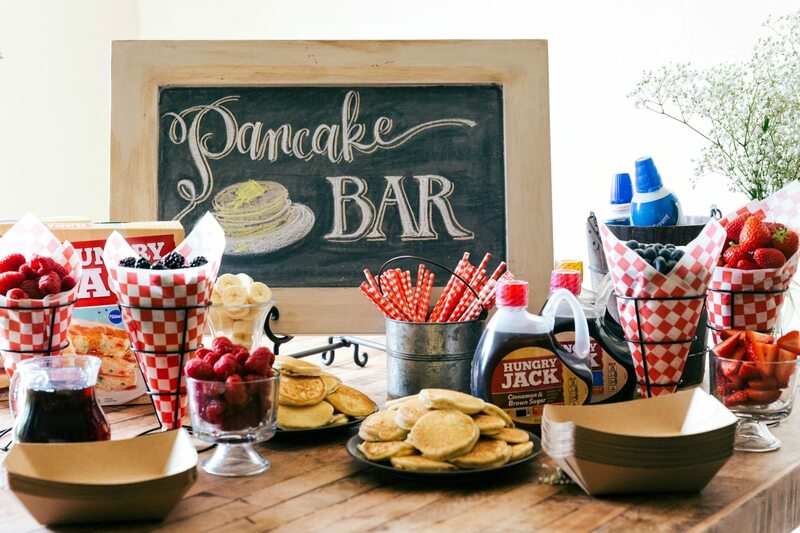 A fun pancake and sparkling juice bar idea – perfect for parties and large get-togethers! 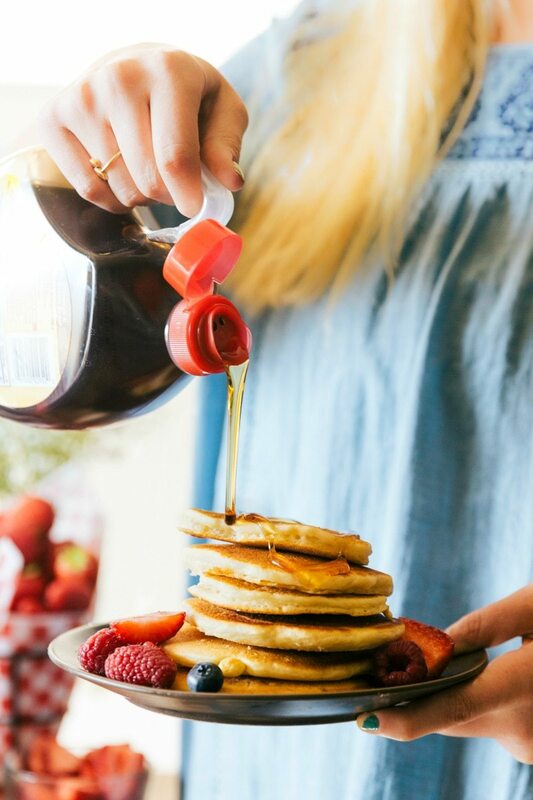 I’ve been beyond excited to share this fun breakFEAST Pancake/Juice Party with you all! 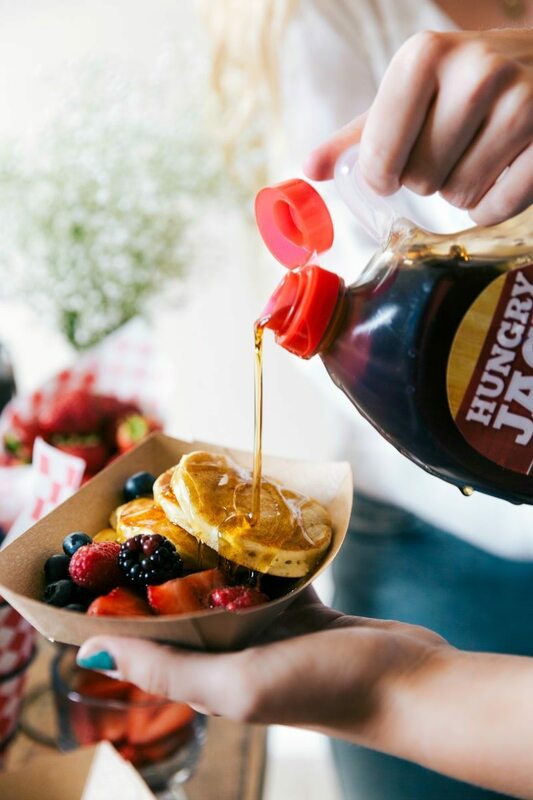 What goes better with pancakes & syrup than juice and what is better than the two of those for a fun Fall breakfast bar/party?! 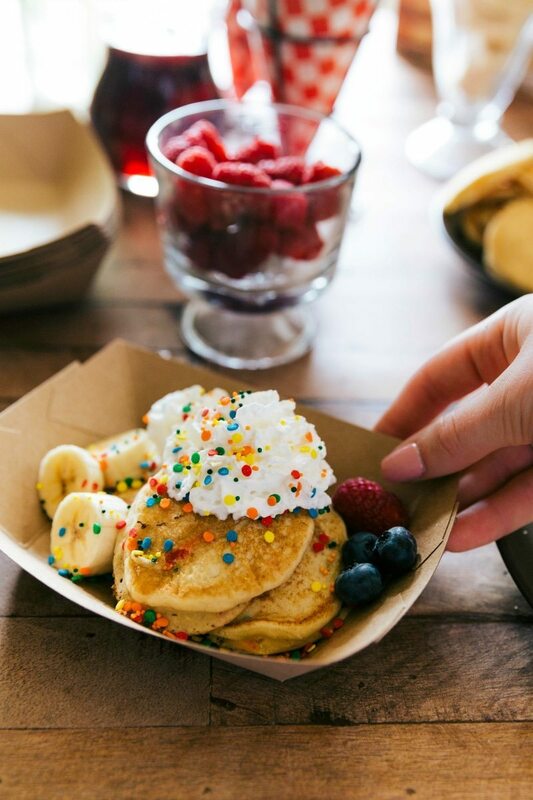 To create this pancake bar, I used pancake mixes (regular + funfetti), tons of fresh berries and fruit (strawberries, raspberries, blackberries, blueberries, and sliced bananas), spray whip topping, sprinkles (for the funfetti waffles of course), and of course lots of pourable syrup. To make sure all the guests could sample both flavors of pancakes and a variety of toppings, I made the pancakes quite small. I used brown food trays for serving (no dripping syrup off of plates!) to make it easier to hold everything the guests wanted to sample. Little Bentley could not get enough berries. I lined french fry/appetizer baskets with checkered paper to put the berries in and add to the overall vibe of the party. I also used a few stems of baby’s breath which I put in thin vases to surround the chalkboards on the table. And the cute chalkboard art? I wish I could take credit for it, but that is my mom’s talent. About 50% of the art in my home is pictures of my babes and the rest is chalkboards that she has designed and decorated. I have a minor obsession with all things chalkboards and unfortunately no talent for writing with chalk. 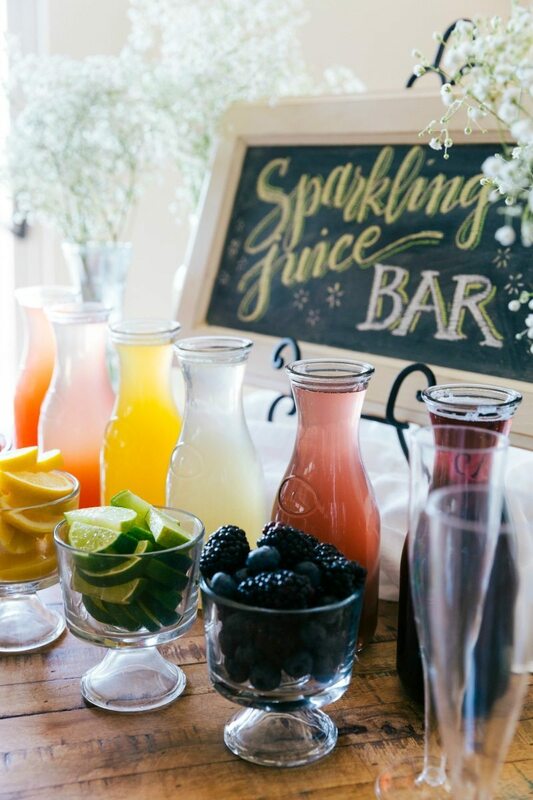 On the other side of the pancake bar, I featured this Sparking Juice Bar. The more pancakes that guests ate, the more juice they drank. The two pair perfectly together! I grabbed some of the same fruit used with the pancakes for the juice bar and then cut up a few other fruits. All in total there was a blackberry/blueberry combo, sliced limes, sliced lemons, sliced peaches, and fresh raspberries. I also had a small bowl of fresh mint that could be added to the glasses. Behind the fruits there was a variety of sparkling juice flavors. 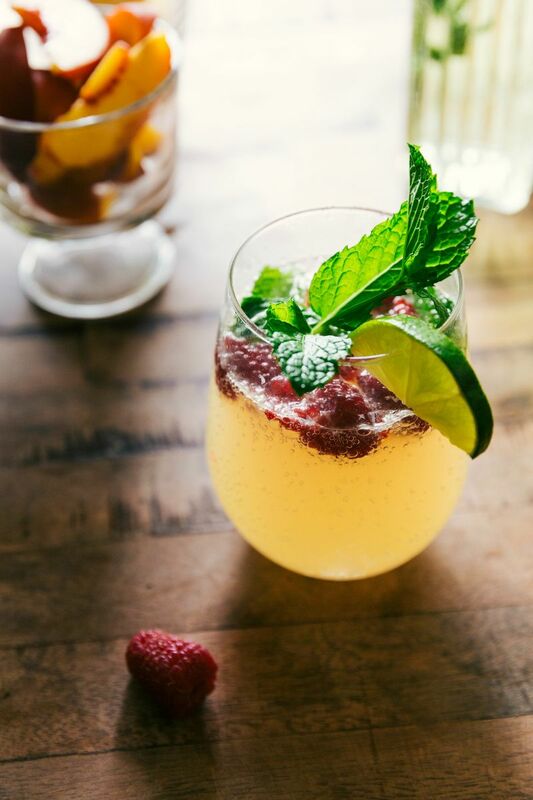 ^^^Favorite drink of the party: sparkling limeade with raspberries, lime, and fresh mint! 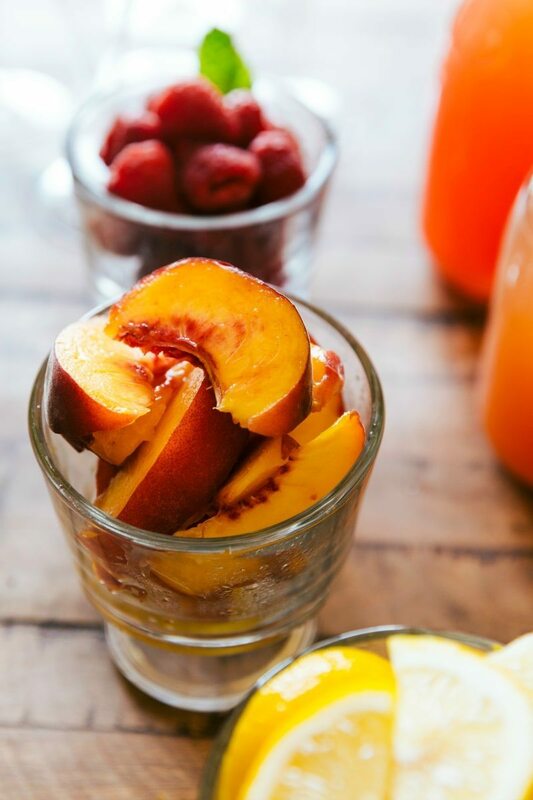 The sparkling juices couldn’t be easier to make, I grabbed 6 different frozen juice concentrates in a variety of flavors and then mixed the concentrates with sparkling water. Chill the sparkling water and then instead of adding regular water to the juice concentrate, use the sparkling water in its place with the same amount as the concentrate suggests. 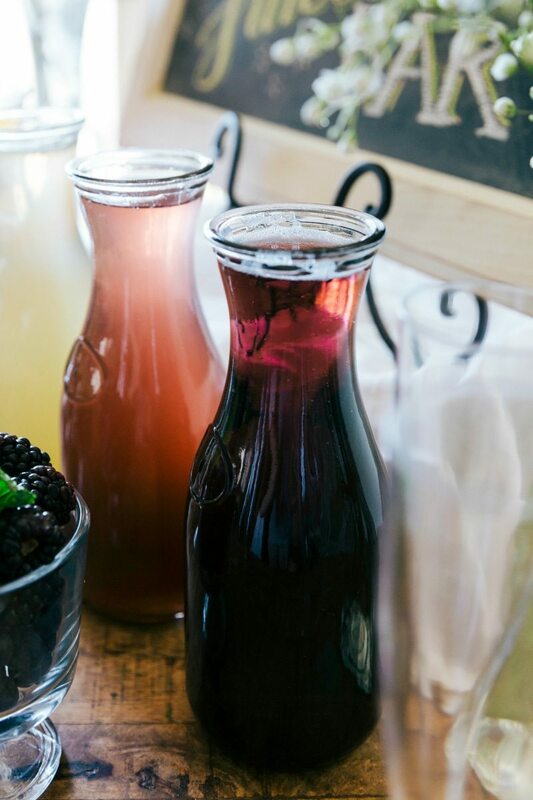 Grab a few liters of sparkling water and the sparkling juice bar is ready to go! And that wraps it all up! Love this idea! Pancakes and waffles are always a favorite in our house. Yum! Pancakes are my fave morning food! This looks so fun! Pancakes are my favorite for breakfast but I usually reserve them for special occasions. Chelsea what a fun post to read!! I LOVE all the pictures especially the one with your cute Little Bentley. Please, say to your mom that I love the chalkboard art. It is absolutely amazing. She is very talented! Although I am a teacher I am like you, I have no talent for writing with chalk! These pancake and sparkling juice bar are incredible! GORGEOUS!! And I love the size of the pancakes! They are so cute 😉 Waffles and pancakes are my absolutely favourite recipes for breakfast. This is such a fun party idea. I love waffles and pancakes. A pancake and juice bar is very creative, I’ve never heard of that before. Beautiful pics. Thanks for sharing! Everything looks delicious! I love pancakes, waffles and french toast. This is a wonderful idea for my daughter’s upcoming birthday party. Pancakes have always been my favorite. From pumpkin to chocolate chip, there isn’t a kind I don’t like. What a great idea! I love a simple over-easy fried egg with a slice of toast for breakfast. I have really grow to love pancakes and breakfast smoothies! I love this! My favorite breakfast food is my mom’s blueberry French toast casserole. It’s a holiday staple in our family and brings back so many great memories. The juice bar is such a good idea! I love love love breakfast scrambles and french toast. I love homemade waffles and pancakes with cane syrup for breakfast. What a fun post! I love grits with a lot of of butter. You have such good ideas about the full meal presentation. Love making waffles for the grands. I gotta say that was one of the most clever and fun breakfast ideas I’ve ever seen! My all time favorite breakfast is cinnamon french toast – simple I know but I love it! I love a wonderful, crumbly coffee cake (homemade, of course) with lots of drizzled confectioners sugar icing on top. I love a good homemade sausage (like my Granddad used to make) and fluffy blueberry pancakes! YUM!! I love French toast. Piled high with real butter, syrup and whipped cream. Makes me hungry! My favorite is definitely french toast. Love breakfast foods. 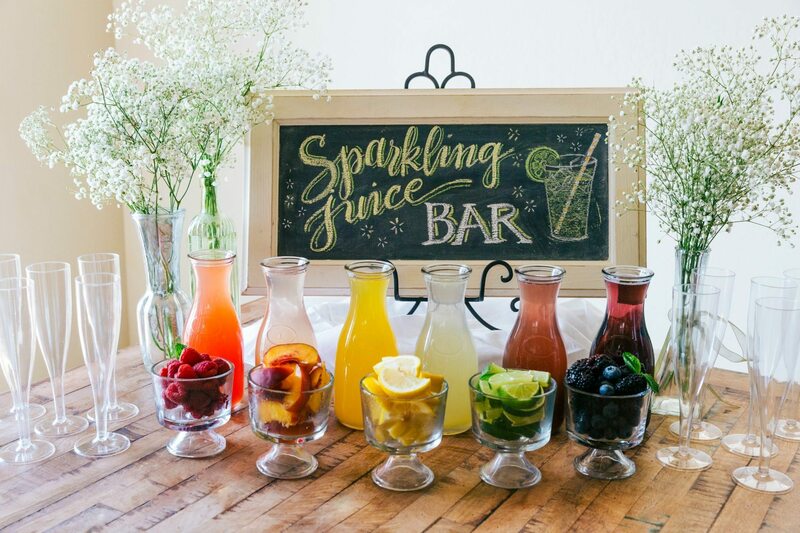 Love your sparkling juice bar, it turned out fantastic!! My favorite breakfast is pancakes and yogurt. This breakFeast party is such a cute idea. I’m going to have to do it with my friends on a Saturday night. Pancakes, french toast & biscuits & gravy are the best…. But I love fried potatoes/hash browns. My favorite breakfast is anything I do not have to make. Having said, that I so love pancakes and real sausage links. Waffles with whip cream and strawberries. I really enjoy your posts, they inspire me to be more creative in the kitchen! My favorite breakfast item is pancakes! I especially like the sparkling juice drink bar. I’ve made lemonade that way for a refreshing addition to our family bbq dinners, and everyone always raves! Such beautiful party ideas! What a fun idea and a great way to make breakfast fun! My favorite breakfast item is homemade pumpkin chocolate chip pancakes! I love pancakes with lilikoi (passion fruit) curd with a side of crisp bacon! My favorite breakfast right now is a 1/2 a sweet potato topped with guac, poached eggs and hot sauce. So yummy!!! Your waffle and juice bars are a very cute idea. We love waffles in our house and have them almost every weekend. My dad died almost 6 months ago and I crave his waffles. Every Sunday for the past ten years he woke up early so he could make waffles and spam for everyone. As I was reading this I realized that I should start the same tradition with my own family. Breakfast foods are magic and this brought a flood of memories of my dad in the kitchen. Thank you! I love waffle for breakfast ! Those pancakes look AMAZING!!!! Definitely trying this for my daughter’s sleepover. Fried Chicken and brown sugar waffles are my favorite breakfast foods. I wish I liked eggs because I see so many wonderful choices. Love your recipes, keep up the AMAZING work!! We love all things breakfast, but our all time favorite is a fresh crisp waffle with butter and syrup, yum ! thanks for the yummy giveaway ! I love this idea… I did a savory breakfast bar with a Bloody Mary bar…so much fun! My favorite breakfast is pancakes. My favorite breakfast…….skillet breakfast. Or maybe pancakes. No, waffles. Or sausage and eggs. Or maybe bacon. Or…….yeah, I like it all! Yum! I love homemade cinnamon rolls and yeast waffles. Brilliant! My kids would go ga-ga over a pancake bar. We LOVE breakfast food. And those sparkling juices…. mmmmmm…. Our family favorite is waffles and our waffle iron of five years just died on us! My favorite breakfast us pancakes. Thanks for the chance to win. I really enjoy making your recipes. Our 2nd favourite are homemade frittatas made with grilled veggies (asparagus/mushrooms/tomatoes/potatoes/cheese). Belgian waffles are my favorite? My favorite breakfast item is not just one thing. But I loooove whole wheat toast and strawberry preserves…omg I can eat it everyday. ? Yummy!! Your pictures and set up are soo beautiful!! My favorite breakfast item is fresh fruit! Banana pancakes with chocolate chips, maple syrup, and whipped cream are a favorite in our house! French toast is definitely our favorite around here but waffles are a close second. What a great post!! Waffles are a favorite at my house! Topped with berries and whipped cream for my 3 kiddos of course!! French Toast has always been my favorite! First off, I LOVE your blogs and have tried many of your recipes. Your recipes are simple and you are also very cognizant of making sure ingredients are reasonably priced and healthy! My fave breakfast is Baked French Toast! I have it on the holidays. Please keep on posting, b/c I keep reading and eating! I love Chocolate chip waffles! My favorite breakfast is French Toast with a side of bacon…..any time of day. I love some yummy blueberry buttermilk pancakes with some vanilla glaze! Delicious! Gravy toast which is creamed chipped beef but with canned chicken. We LOVE waffles… especially with buttermilk syrup. I love waffles the funny thing is I hated waffles and pancakes up until last year I don’t know what change but something did! I love chocolate chip pancakes with a lot of syrup! Your breakfast party looks fun, clever, and so tasty! My favorite breakfast is sour dough waffles made from my Grandpas start. Probably 30 plus years old that sour dough starter. I just stumbled on your recipes on Pinterest! I really like what I’m seeing so far. This is a great idea for a breakfast/brunch idea that I may implement myself, especially with family visiting for the upcoming holidays. I love, love, love a good Brioche French toast topped with fresh strawberries and bananas. Fruit is an important part of breakfast for me. We like breakfast at dinner time. My favorite is migas. French toast is my favorite breakfast item. I usually take two pieces and make a grilled cheese sandwich with them. It tastes like an omelet, but is handheld. A griddle is perfect for doing that. This is beautiful! Definitely mimosas with everything, but avocado on toast with lots of black pepper and a sprinkle of Himalayan pink sea salt is my favourite! Pancake bar is a perfect idea ! So excited to try it! My favorite breakfast is eggs, bacon and sausage. I love a breakfast sandwich. And chocolate chip pancakes, because I am a child. I like apple cinnamon steel cut oatmeal or breakfast burritos with eggs, beans and salsa. Right now I’m obsessed with huevos rancheros for breakfast! I love your recipes so much! So thank you for giving me such a great resource for home cooking! I particularly love your foil pack recipes. Chicken and waffles! Yum. Best combo of sweet and salty. My favorite Breakfast is french toast!! We love pancakes with sausage or bacon. My favorite thing to have for breakfast is chocolate oatmeal! I like Belgian waffles the best for breakfast. Love savory oatmeal with cheese, avocado, and a runny egg! I love the idea to make smaller pancakes. I didn’t know how to make sparkling juice. Thank you! Our favorite breakfast is waffles. I still use the iron I received as a gift 23 yrs ago as a wedding present. I freeze berries from our garden and make syrup all year to put on our waffles and pancakes. We have occasional breakfast for dinner – I should totally add some yummy juice too! I love pancakes for breakfast! I am in a Moms club and we have monthly brunches. 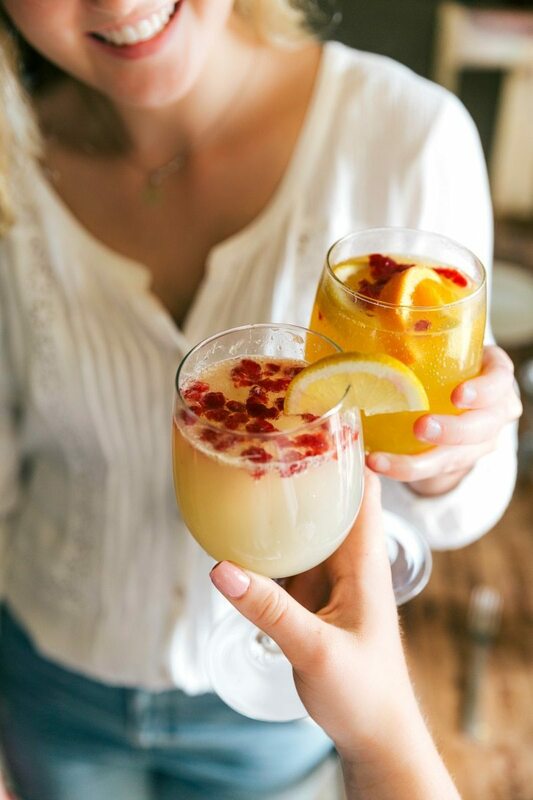 A pancake and sparkling juice bar would be a perfect brunch idea! My favorite breakfast item is pumpkin french toast. I love waffles , eggs and bacon on the side. I love pancakes, and think your idea to make small ones so you can try several different toppings is very clever! And the sparkling juice bar is a very festive touch. PIE! Who can resist a piece of leftover pie for breakfast 🙂 I would settle for pancakes too, if someone else besides me was doing the dishes! My favorite is warm fluffy scrambled eggs, bacon and croissants. BACON. I can’t get enough of it. I also love hash browns and biscuits.